To see a list of all emails sent by the studio using the express message feature for the last two months..
Go to Mail – Express Send Mailbox. You can filter for a specific message using Subject or Date sent. It now shows each recipient email address individually. If you see the message in the list it is being sent or already has been sent from our server successfully. 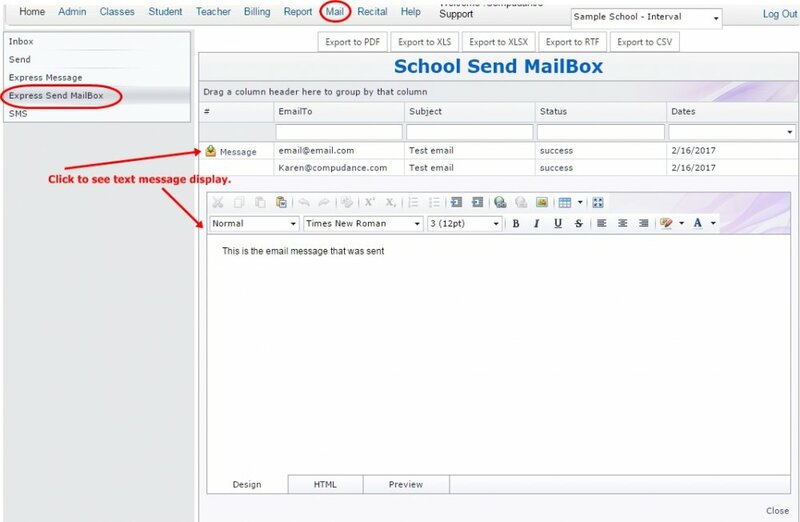 You are able to Search using the filter boxes for a specific email address recipient, subject line and date sent. You may sort, group or export the report list. If there is a delivery issue, your studio email address should receive a Delivery Notification Failure email in the studio email address inbox. The failures could be for many reasons that are out of CompuDance’s control. The recipient’s email address is wrong or does not exist. The recipient’s email box may be full or not accepting messages. The recipient may block emails from third party servers.